There’s a slap for that. The letter does not specifically mention Google Maps’ new speed camera notification, but the broad language could be construed to cover such information as well. The letter caps a brief window of time during which the public was not even aware of the new Google Maps feature and the NYPD writing its warning letter. Commuters said they only noticed the speed camera warnings late last week. Google did not announce the new feature publicly, but it was first discovered by the website, AndroidPolice.com. There had been some coverage in the tech press, which suggested that drivers would be enthusiastic about the changes. Mashable offered this screen shot of what the service looks like in England. The speed cameras are marked in orange. “Google Maps Wants to Help you Avoid that Speeding Ticket,” read a headline in Mashable. 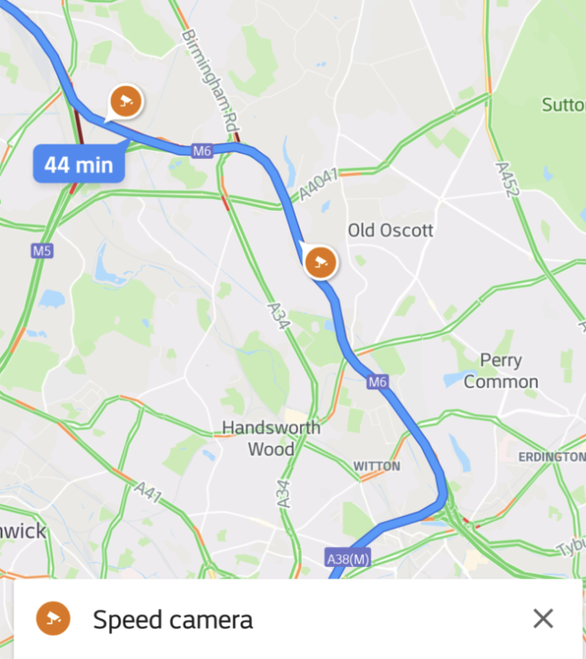 The outlet reported that Google Map users have been able to report “speed traps” since late last year, but the app didn’t enable the feature until now. The best part? That’s not how the NYPD sees it. “Individuals who post the locations of DWI checkpoints may be engaging in criminal conduct since such actions could be intentional attempts to prevent and/or impair the administration of the DWI laws and other relevant criminal and traffic laws,” the letter stated. “The posting of such information for public consumption is irresponsible since it only serves to aid impaired and intoxicated drivers to evade checkpoints and encourage reckless driving. Revealing the location of checkpoints puts those drivers, their passengers, and the general public at risk. The Waze police checkpoint feature has been under fire for years, with a national sheriffs group and the NYPD’s sergeants union demanding that it be deactivated in 2015, days after Brooklyn police officers Wenjian Liu and Rafael Ramos were ambushed in their squad car by a killer who had the Waze app on his phone. Nothing came of those demands — though in 2017, France made it illegal for apps to reveal the locations of speed cameras and radar — until this weekend’s NYPD letter. Street safety activists, such as Jonathan Rogers (tweet below), have long complained about how the Waze feature undermined enforcement tools and strategies that took years to implement. 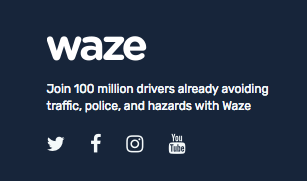 The kind of attitude about police enforcement was disconcerting from the popular Waze, but it is particularly alarming when deployed by Google Maps, which is far more widely used than any other navigation system. A 2017 study revealed that Google Maps is the navigation app of choice of 67 percent of smartphone users who say they use a digital map. The next-closest app in popularity was Waze at a mere 12 percent. As such, safety activists are concerned that speed camera effectiveness is about to decline dramatically. Members of Families for Safe Streets, for example, spent much of the summer staging almost-daily rallies in support of New York City’s speed camera program, which the state legislature allowed to expire before the City Council and Gov. Cuomo worked out a deal to restore 140 school-zone systems — a pact that remains in effect today. The governor has proposed expanding the program to 290 cameras — far short of the 1,000-plus systems activists wanted. But no matter how many cameras are installed, they will fail to do the job if scofflaw drivers are alerted to their location, said Amy Cohen of Families for Safe Streets. Janoff, the transportation planner, took a broader view. Neither Google nor Waze answered multiple requests for comment from Streetsblog. When Waze tells me “police reported ahead”, boyyyy do i slam on my breaks ? The NYPD letter is embedded below. What we have there is a troll. A troll never argues in good faith; it merely aims to provoke. For this reason, any response (even one in which one endeavours to provide good information in rebuttal) amounts to giving the troll what it wants. The appropriate way to deal with a troll is to ignore it until it goes away. Profits do not prove intent or effect. I’m not sure how cameras, which cost almost nothing, would lose money if they only caught occasional speeders. Of course, you’re still proceeding under the assumption that speed limits don’t matter–which again, has been proven wrong. Speed cameras from the for-profit companies run about $3,000 per month per camera. Red light cameras run $4,000 – $5,000 per month per camera. Then add the local administrative costs for police to review the videos and court costs for challenges. This does not amount to nothing. And remember, the cameras are “sold” to governments on the basis they are “free money” with the for-profit camera company paying all the equipment and set up costs, the first run reviews of every video (often in Arizona or Massachusetts), and the printing & mailing costs for the tickets. Then the for-profit camera companies and their governmental business partners split the profits on some basis. You can raise or lower a posted limit by 15 mph and the actual change in the speeds at or below which the slowest 85% of the drivers travel will change by a maximum of 3 mph, but usually by 0 to 2 mph, with an average change of 1.5 mph – too small to have any notable effect on safety. The for-profit NMA is looking for suckers who take their claims at face value. Don’t be a sucker. I simply want to tell you that I am just very new to blogs and honestly liked your web blog. Very likely I’m planning to bookmark your site . You amazingly have very good writings. With thanks for sharing your website. 2. I would think the police WANT people to tell each other to slow down. It also justifies insurance payouts. Without a police report, you can not file an insurance claim.